Point2 Homes gives you far more than a simple list of luxury homes for sale. Get instant access to a lot of relevant information about Kelowna, BC luxury real estate, including property descriptions, virtual tours, maps and photos. The search results pages also have a wealth of information on Kelowna, BC, right below the listings. You can use Kelowna, BC luxury real estate prices, square footage, amenities and many other criteria among the deep filter functions on Point2 Homes to help narrow down your search. Price drops are another feature at your disposal, useful in finding luxury homes for sale which have had their asking prices reduced in the past six months. Use the map view to find Kelowna, BC luxury houses for sale, based on amenities or city features that you may want close by. You can close in on a specific neighbourhood or area by simply drawing around it with the polygon or radius tools. Stay informed about the latest entries on the real estate market by saving your searches. This way, you get new listings in your inbox, daily or every week, based on your preferences. If you’d like to get in touch with a professional, agents are displayed next to their listings, along with all their contact information and a handy online contact form. If you want more options, you can go to the Tools tab and Find an Agent, and you’ll get a list of helpful and knowledgeable real estate agents in Kelowna, BC. 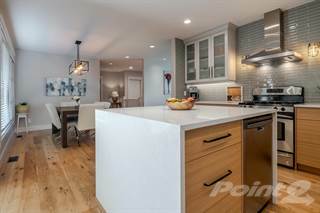 Visit the Point2 Homes blog and you can find up to date expert advice on many markets throughout Canada, regular market reports, neighbourhood scoops in cities throughout the provinces, luxury real estate deals and useful recommendations. Kelowna is an urban and rural city located in the heart of British Columbia’s Okanagan Valley, in the interior of the province. The city has a population of 194,882, and is the third largest metropolis in BC. Kelowna is set on the beautiful Okanagan Lake, and is bordered by towns like Penticton, Vernon, and Summerland. The city covers an area of 211.82 sq.km, and its unique setting makes it a desirable place to live. It has an oceanic/humid continental climate and experiences hot and dry summers and fairly cool winters. The Okanagan Lake has a large effect on the climate, and the very hot summers create the perfect conditions for grapes and vineyards to thrive. Kelowna is one of BC’s top cities for both visitors and residents. The city combines both rural and urban living, offering an abundance of outdoor and water-based activities, vineyards and local wine, culture, and winter sports at the nearby Big White Ski Resort. Because of its great amenities and climate, agriculture and tourism are key contributors to Kelowna’s economy and the service industry is a huge source of employment. Kelowna’s economy is set to strengthen even more due to more consumer spending and tourism, and population growth. The tech sector has also expanded massively in recent years and contributed around $1.3 billion to the economy in 2015. Kelowna has quickly become one of the fastest growing cities in North America due to its attractive climate and great quality of life, and many people are moving in from other areas around BC and Canada. Visible minorities make up around 6.2% of the population in Kelowna, with the rest of the population made up of white (90.4%) and Aboriginal (3.4%) residents. Kelowna consists of 10 key areas, each of which has multiple neighbourhoods. Popular areas in Kelowna include: Baron Road, Bellevue, Bertram, Chichester, Dilworth, Glenmore, and Leathead. Kelowna’s strong and growing economy is also supporting major real estate growth. Kelowna has experienced a turnaround in the last decade and its property market is currently booming, largely driven by people moving into the city from areas like Vancouver, and people attending University in the city and deciding to stay. 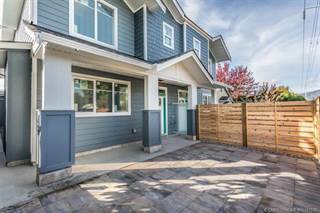 Prices are much more affordable in Kelowna than in other areas of BC, so it’s a very attractive place to buy, for both local buyers and investors. The average residential sale price rose around 14% year-on-year, with the average house price sitting at $493,887. The recent introduction of the Foreign Buyer Tax may slightly halt foreign investment; however, local buyers still dominate the market especially those looking to upgrade to a larger property as well as first-time buyers. Single-family homes are the most in demand, representing two-thirds of the activity. First-time buyers have become more active in the condo and townhouse market due to the rising prices of single-family homes. A lot of people who attend one of the educational institutes end up staying in the city, and stats show that as many as 60% of graduates settle in the area after education. It’s currently a buyer’s market with a good amount of inventory of condos and single-family homes to choose from. Rental vacancy rates are fairly low, creating favourable conditions for those looking to rent out their existing properties or invest in a rental unit. Kelowna’s luxury market is booming at the moment and there has been a significant uplift in demand for upper-end properties. Demand has been largely driven by buyers migrating from the Lower Mainland of BC to Kelowna in search of more affordable luxury properties and more value for money. 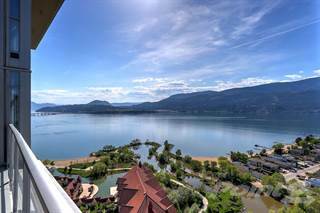 Kelowna offers everything from sprawling waterfront properties to high-end condos, and many retirees are opting for luxury condos and downsizing their larger properties. The entry level price for a waterfront home is around $1.5 million. It’s thought that the luxury market will moderate slightly but still remain very strong throughout the year. The Okanagan Mission, particularly Upper Mission, is seen as one of the most luxurious neighbourhoods in Kelowna, due to its beautiful views of the city, as well as Dilworth Mountain which has been largely developed in recent years and features many high-end homes, costing upwards of $1-million. Read more about living in Kelowna, BC.